Blue Valley Recreation Commission was recognized a second time by Blue Cross Blue Shield of Kansas City and the Kansas Recreation & Park Association (KRPA) for the Commission's commitment to creating a healthier community. The BlueCHIP® award, which stands for community health improvement program, comes with a $2,500 grant to further healthy programs. Blue Valley Rec also won the award n 2013. Blue Valley Rec partnered with Kansas City Internal Medicine (KCIM) to host the first Walk with a Doc (WWAD) program in the state of Kansas. The national walking initiative, started by Dr. David Sabgir, seeks to change the course of heart disease, obesity and quality of life by reversing the consequences of a sedentary lifestyle in order to improve the health and well-being of a community. 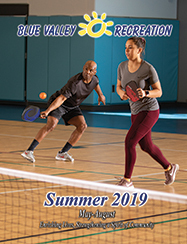 "Improving community health is a priority for Blue Valley Recreation," said Blue Valley Rec executive director Steve Baysinger. "Earning recognition with the Blue Cross Blue Shield Blue CHIP Award validates our progress. Partnering with Kansas City Internal Medicine and Walk with a Doc has expanded our programming expertise and capabilities to better serve our community." WWAD meets the second and fourth Saturdays of the month for a 5-10 minute health talk from KCIM's Dr. Keith Jantz followed by a 30-45 minute walk. On nicer days, the talk and walk takes place on the trail at the Rec Complex on 137th Street in Overland Park. The group moves indoors during inclement weather days and walks at Oak Park Mall. "We are very appreciative of the BlueCHIP award," said Blue Valley Rec Commission Chair Colleen Browne. "Our community has high expectations for health and wellness and we are excited to meet these standards with the help of community partners such as Dr. Jantz and Kansas City Internal Medicine." In its fourth year, BlueCHIP® is a community health improvement program created to recognize and reward Kansas communities who encourage and support healthy lifestyles through programs, policies, initiatives and community events. Agencies receiving the award are eligible again in two years. Blue Cross Blue Shield of Kansas City provides winners from any of the following communities: less than 30,000 and a community of 30,000 or more in Johnson or Wyandotte counties.